In this project we are going to interface TCS3200 color sensor with Arduino UNO. TCS3200 is a color sensor which can detect any number of colors with right programming. TCS3200 contains RGB (Red Green Blue) arrays. As shown in figure on microscopic level one can see the square boxes inside the eye on sensor. These square boxes are arrays of RGB matrix. Each of these boxes contain Three sensors, One is for sensing RED light intensity, One is for sensing GREEN light intensity and the last in for sensing BLUE light intensity. Each of sensor arrays in these three arrays are selected separately depending on requirement. Hence it is known as programmable sensor. The module can be featured to sense the particular color and to leave the others. It contains filters for that selection purpose. There is forth mode that is no filter mode. With no filter mode the sensor detects white light. 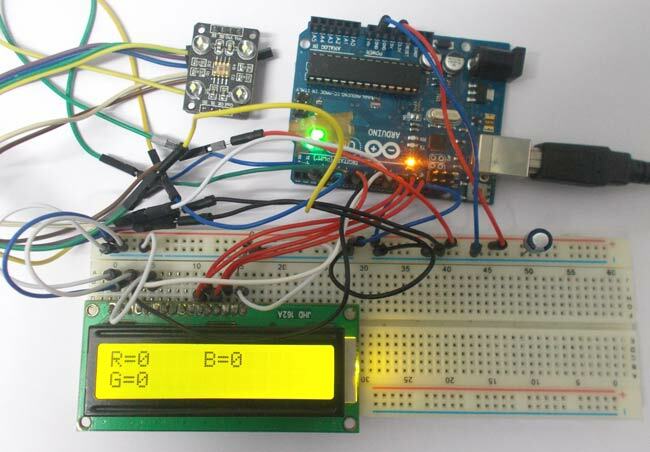 Hardware: ARDUINO UNO, power supply (5v), LED, JHD_162ALCD (16*2LCD),TCS3200 color sensor. Software: ARDUINO IDE (ARDUINO nightly). The color which needs to be sensed by the color sensor is selected by two pins S2 and S3. With these two pins logic control we can tell sensor which color light intensity is to be measured. Say we need to sense the RED color intensity we need to set both pins to LOW. Once that is done the sensor detects the intensity and sends the value to the control system inside the module. The control system inside the module is shown in figure. The light intensity measured by array is sent to current to frequency converter. What it does is, it puts out a square wave whose frequency is in relation to current sent by ARRAY. So we have a system which sends out a square wave whose frequency depends on light intensity of color which is selected by S2 and S3. The signal frequency sent by module can be modulated depending on use. We can change the output signal frequency bandwidth. The frequency scaling is done by two bits S0 and S1. For convenience we are going to limit the frequency scaling to 20%. This is done by setting S0 to high and S1 to LOW. This feature comes in handy when we are using the module on system with low clock. The Array sensitivity to color is shown in below figure. Although different colors have different sensitivity, for a normal use it won’t make much difference. The UNO here send signal to module to detect colors and the data received by the module is shown in the 16*2 LCD connected to it. The UNO detects three color intensities separately and shows them on LCD. The Uno can detect the signal pulse duration by which we can get the frequency of square wave sent by module. With the frequency at hand we can match it with color on sensor. As by above condition the UNO reads pulse duration on 10th pin of UNO and stores it value in “frequency” integer. We are going to do this for all three colors for color recognition. All three color intensities are shown by frequencies on 16x2 LCD. How many colors it can detect? Is it possible to you in for measuring skin color? Thank you for replay. Yes, it can detect any color and gives you RGB values of that color. You can convert those RGB values into color, many online tools are available for this. I need to understand better how you derive the "Output Frequency Scaling"; for example how you set 2% on S0 = H, S1 = L and the rest. This is defined in Color sensor TCS3200 datasheet. The sensor cannot measure higher distances, the maximum distance is 3cm. With the increment in distance the accuracy gets decreased. Do that arduino have any specification ? Will this code work for other models of colour sensor? I use the Adafruit TCS34725 and I'm constructing a colour sensor module with an LCD screen. what is the function of capacitor in this project? Capacitor is connected across the power supply to filter the noise from the power supply unit. What version of arduino is used in this project and please send me the complete tutorial. Using this project idea can one then convert the colours to sound. If possible what can I add?. which sensor are you using? You can detect any color with this project. Every color is made up of RGB colors, so this circuit gives you values of RGB for every color you scan. Give a tutorial how to build this..
Thats a good idea! yes we can do that, but I suggest you to use NeoPixel LED to display the colors. Yes, they are RGB values. pins - but I dont see a OE pin on my board ! I suspect that the LED pin is the OE ? Is this about right ? Can this sensor be used in detecting the color of the liquid inside a test tube??? Yes, it should detect the color of liquid. What do you mean by that being a programmable sensor? Do we have to set the sensor when detecting a specific color? Yes you can program it to only sense the particular color and leave the others and acts like a filter. Hi guys, doing a project but I need a very small color sensor. Every sensor I seen so far is quite big, any idea where I can found the smallest version? It will cost you around 50$. pls can u give a full project report on this project? with you experience unconsistence result RGB in lcd display? Is "pulseIn()" a function from a library that needs to be brought into the Arduino IDE, or is it an intrinsic in the C# language set supported natively? Thanks for your example and code, this is great. I looked on stackoverflow.com which has a lot of great arduino info, and believe I have confirmed that indeed PulseIn() is part of the C# implementation. Hi, this tutorial was extremely helpful and I cannot thank you enough. I want to take it a step further. Can we add a RGB LED somewhere and ask it to generate the same color as the one detected by the sensor? So in short, Color X---> Sensor ---> Arduino ---> RGB LED ---> Color X. Can it detect only three colours, if no pls tell the modifications to do so that we can detect more than 3 colours. I have made this project. However, I find that all three values (R,G and B) are very close to each other, irrespective of what colour object is held up in front of the sensor. For example, without any object, I get R=188, B=183 & G= 190. Then when I bring a red object close to the sensor, it shows R=610, B=605 and G=620. With a blue object, I get R =676, B=670 and G = 690. Same is the case with a green object. It shows a greater value for green even when you put red color in front of the sensor. Why does this happen? Hi !, Thanks for this. here, when we measure visually red colour thing, lcd shows higher 'G' value than 'R' value & so on .How to avoid this problem ? It is a problem of tcs 3200 sensor , what is the suitable sensor ? i need a sensor that detects only green color . What would be the best one to be used?